The world of scopes and binoculars is an ever-evolving industry. There are new products being pushed out constantly, with new technologies and features becoming available. With many people picking up nighttime activities such as hunting and hiking, night vision devices are in constant demand. However, the choice is vast. First you need to decide what you get – whether you want night vision technology, or a thermal imaging scope. For hunters, thermal scopes will give you more range, and often better features, so this is where you want to be. Even when you do decide that you want a thermal imaging scope, how do you decide what’s the best thermal scope for you? There’s a plethora of options, from brands, to sizes and sensors, and prices. If you’re an experienced hunter, you know what to look for, and where to invest your money. But what if you’re not? Everything from the worst to the best thermal scope will cost a pretty penny. Spending that much money on a device you aren’t sure about is a big mistake. In order for you not to make such a mistake, we’re here to help. Regardless of whether you’re an expert who has been hunting for years, or someone who’s just getting into it, we have something for you. Below you will find five of the best thermal scope options you can find on the market today. They’re all made by reputable brands, and they all cost quite a bit. They also offer differing qualities and features, so you can choose what works best for you. In case you still can’t make up your mind, or don’t know where to spend your money, we also have a buyer’s guide. If you read through it, you will find information on everything you should know before you purchase. From technologies available, to which numbers mean what, as well as some other factors that you need to consider. Without wasting any more time, let’s begin with the products. 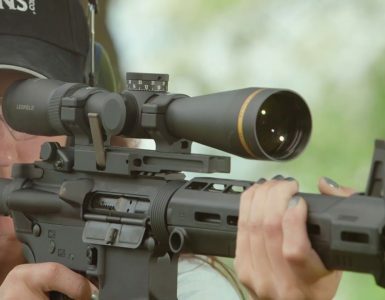 ATN Corp is a well known player in the sport optics game. They’ve made a good name for themselves by selling high quality gear. It’s often packed with high-end electronics, such as the X-Sight 4K Pro, which packs Bluetooth, Wi-Fi, recording and a smart rangefinder. Their optics are excellent, and their products tend to be built really well. Such is the case with their Thor 640, we’re glad to say. It’s the bigger, better brother to the Thor 384, and it’s one of the best thermal scopes we’ve ever reviewed. Compared to the 384, this one has a higher resolution thermal sensor. Sure, it does come with a price to match, but thermal scopes aren’t cheap, and this one is very much worth it. If you’re interested in all the details, read on. Let’s get one thing out of the way first. The Thor 640 comes in four configurations. From the smallest, cheapest 1-10x, to the 1.5-15x we’re looking at today, and the 2.5-25x and 5-50x, they’re all excellent. We’ve found the 1.5-15x to give plenty of versatility. With a variable magnification, you can choose between a wide field of view, almost as wide as your natural eye, or getting really close to your target. It’s also the lightest one in the whole range at 1.55 lbs. Apart from the magnification and weight, the features are shared throughout the whole range. We mentioned that ATN often pack a lot of smart features in their scopes. The Thor 640 is no exception. This isn’t just a thermal imaging scope. It’s a much more advanced product. To begin with, it has a ballistic calculator to calculate the trajectory of your bullet. This eliminates any guesswork on your end. You will also find a rangefinder, which tells you exactly how far your target is. With an 874 yards detection range, not having to guess is very handy. Then, you have the smart zoom. Other scopes tend to mess your focus and field of view up when zooming, but not the Thor 640. It helps you keep your target in sight. The thermal sensor has a resolution of 640×480, and you’ll get clear images in complete darkness. What you won’t find in many other scopes is the ability to record a video. Whether you want it for bragging rights, or just for reviewing your footage later, this can come in handy. In case you think you could miss recording good footage, there’s RAV, or recoil activated video. In RAV mode, you can be sure that your shot will be recorded without you having to worry about it. It’s recorded and saved on an SD card (you have to provide one, though). You can also download it straight to a mobile device, such as your smartphone or your tablet. With Wi-Fi and Bluetooth, this is possible both from Android, and iOS. The wireless functionalities also help with the remote, as well as the Obsidian app. This lets you look at a live stream of your scope, or, as mentioned earlier, review the footage. While we’re at the smart features, the profile manager will come in handy. You can set up a profile for each of your weapons, and not have to zero the scope every time you swap a weapon. In terms of battery life, the 4 AA batteries used should give you around 8 hours of use. In case that isn’t enough, ATN offers a battery pack that can keep you powered for up to 22 hours. The scope works well with glasses, thanks to the eyepiece focus. What you should be careful about is recoil potentially damaging your glasses, or your eye. Unfortunately, the Thor 640 doesn’t work as a regular scope during the day. Yes, you could use it, but you’ll still get thermal images, and it might cause foliage to stand out a bit more. You might want another scope for daytime use. To wrap things up, the ATN Thor 640 is an amazing thermal imaging scope. It does all the basics really well, and gives you a clear, sharp image – something that’s crucial for hunting. Aside from that, you get a host of other nifty features, making this possibly the best thermal scope if you want something that’s jam packed with various features. If you’re looking at thermal scopes that do more than just give you an image, you should absolutely consider the Thor 640. Just like ATN, Pulsar is another household name in the optics game. They have quite a few products, and all of them are actually really, really good. What that means is that the Pulsar Trail XQ has some big shoes to fill. From our experience, we’ve found that it does manage that successfully, and then some. It comes in a couple of configurations, but the one we’ll be taking a look at today is the 2.7 option, which has a 2.7-10.8×42 magnification. It is by far the most popular option of the bunch, and you’ll absolutely love it. With a decent resolution sensor, and a couple of smart features to make things easier and better, this could be one of the best thermal scope options you could go for. Let’s take a look and see how it fares when pitted against some of the other thermal scopes on our list. To begin with, we have the magnification factor. From 2.7x to 10.8x gives you a lot of versatility. From a fairly wide field of view, to getting in extremely close, it’s just a matter of choosing. The field of view is 7.5 degrees. There’s a very impressive detection range of 1970 yards, that lets you engage targets without even getting close to being seen or heard. If you’re after fluid imaging and a field of view with plenty of contrast, you’ll get that, and more. Thanks to the ‘white hot’ and ‘black hot’ modes, and the smooth 50Hz refresh rate, what you’re looking at through the Trail XQ will be clear and sharp. There are 13 variable electronic reticles for you to choose from. The sensor has a 384×288 resolution with a pixel pitch of 17µm. You’ll get the image displayed on an AMOLED display with a resolution of 640×480. Moving on to the smart features, there are plenty here. To begin with, we have the magnification. You can either go for a 2x step-up magnification, or a smooth, graduated one if you’d rather keep your field of view customized. While we’re at the zoom, we must mention the Picture in Picture mode. Basically, this gives you a magnified image of the area where your reticle is, at the top of the display. Don’t worry about this obstructing the field of view, it only takes up 1/10th of the display. There is a built-in accelerometer and gyroscope that accurately determines cant and angles that are larger than 5 degrees. When you combine this with the stadiametric rangefinder feature, you get an accurate measurement of your target, thus eliminating any guesswork on your end. You can save up to 3 rifle profiles, with 5 zero saves. This means you won’t have to zero the thermal imaging scope every time you change a weapon. The Trail XQ’s highlight smart feature is undoubtedly the StreamVision Wi-Fi feature. You can link the device via Wi-Fi with an Android or iOS device which has the free StreamVision app installed. This lets you get real-time footage, or even remotely operate the device with your smartphone. If you’d rather not use the phone as a remote, though, there’s an ergonomic remote control. 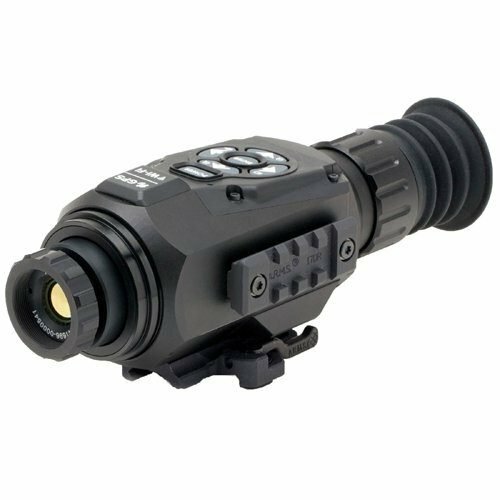 This lets you operate just about any feature without touching the thermal imaging scope itself. One thing we didn’t see with the ATN, which has similar options, is the capability of streaming the footage to YouTube. Oh, and the app also allows for firmware updates to the device, which add new functions and capabilities. Wrapping things up with the build quality, you have an IPX7 water resistance rating. According to the IP rating chart, this lets you submerge the device in 1m of water. We wouldn’t test that out with a device this expensive, though. It’s built really well, and the buttons are placed in convenient locations, so you don’t have to hunt for them. The Trail XQ is a strong competitor to the ATN thermal imaging scope we spoke about earlier. There are some features that are better, while others are worse, but it’s overall an excellent scope. From good build quality and optics, to the stellar performance and host of smart features, you really can’t go wrong with it. One of the best thermal scopes we’ve ever reviewed! If you’ve ever heard of FLIR, you know that they’re the absolute best brand when it comes to thermal imaging devices. 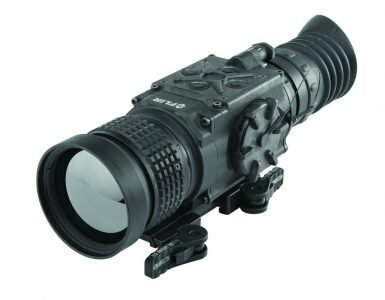 Armasight is their scopes-oriented sub-brand, which makes use of FLIR’s thermal imaging technology to produce some really stunning nighttime devices. An excellent example is the Zeus 336 3-12×50 we have today, which is a part of the Zeus lineup. It’s made for cutting edge performance, and it actually manages to over deliver on that claim. The Zeus 336 actually comes in plenty of different models, but the 3-12×50 is what we’ll be focusing on. 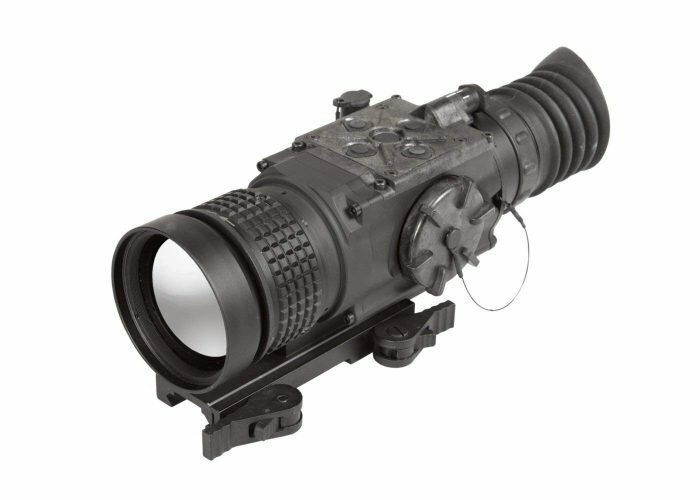 It was primarily made as a weapon scope, but it can also be used as a magnified spotting scope, or as a handheld thermal imaging device. Let’s see how it fares and whether you should invest your money in one. For starters, the Zeus 336 is based on the FLIR Tau 2 Vox microbolometer core. This technology has been in use for UAVs, UGVs and handhelds for a while, so it’s tried and tested as an option. This is a 17-micron uncooled FLIR core, which has much improved electronics over the competition. You also get quite a lot of features, such as continuous digital zoom and increased sensitivity. The powerful image processing results in high-resolution imagery if used during the day, as well as enhanced vision during the night. For increased reliability and accuracy, there are user-adjustable imaging tools: ACE (Active Contrast Enhancement), DDE (Second Generation Digital Detail Enhancement), SSO (Smart Scene Optimization), SSN (Silent Shutterless Non-uniformity Correction) and AGC (Automatic Gain Control). When combined with the sensor, you get a truly stunning optical performance. Inside the Zeus is an AMOLED SVGA 800×600 display, with a 336×256 pixel array format. The optical magnification is 3.4x (PAL) or 2.8x (NTSC). There is a 60Hz refresh rate, twice what you’ll find on many other competitors’ thermal scopes. This gives you a much smoother view, something your eyes will thank you for. It also makes sure the target tracking is smooth, even while moving. The analog input and output format are user selectable, between PAL (768×574) or NTSC (640×480). You won’t find Bluetooth or Wi-Fi here, as this is a purpose-built tool. However, there is the optional digital video recorder with an SD card slot, as well as onboard replay. Build quality and ease of use are good. With a CNC machined construction, made of aircraft-aluminum alloy, you can use it in various environments without worrying about it getting damaged. It is based on the MIL-STD-1913 mechanism. 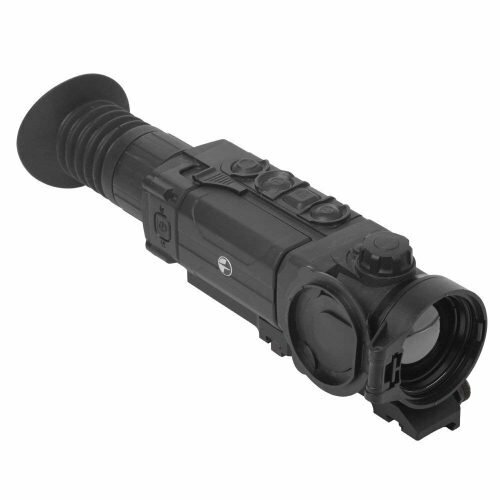 Therefore, installing or removing the thermal imaging scope on a Picatinny rail is extremely simple and reliable. All the features and functions are operated by simple, intuitive controls. The drop-down UI and easily understandable control functions let you completely customize your scope, and take advantage of the variety of settings. If you’d rather keep your hands off the scope, you have a wireless remote control that lets you do so. So, who is it for? The price of the Zeus 336 doesn’t really put it out of reach, it is priced similarly to the competition. However, instead of adding smart features, it focuses on doing thermal imaging really well. This makes it more suitable for a different market. It’s a state-of-the-art thermal imaging scope, and it’s made for serious hunting or military warfare. You could also use it as a handheld thermal imaging device for heating and cooling inspections. But if you’re a hobbyist, you might not need all the high-end performance. Instead, maybe you would do even better with something that gives you a fraction of the performance, but instead offers smart features such as Wi-Fi and live streaming. The Zeus is a tool, not an accessory. 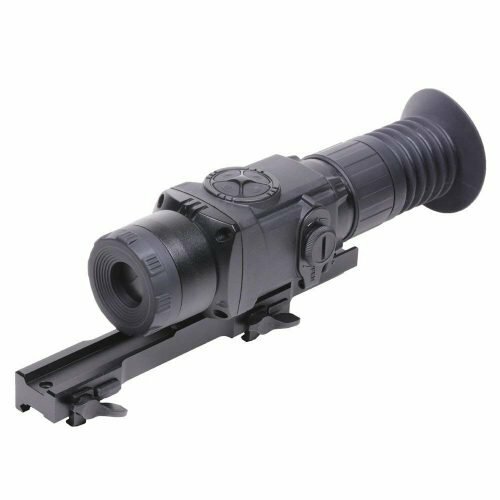 All of the features make it one of the most sophisticated, best thermal scopes, and its well worth the asking price, provided you fit the target market. Even though neither of the good thermal scopes you’ll find are cheap, to say the least, there are some that are truly exorbitantly expensive. What’s even more interesting is that some of them are actually worth that high price. One of those thermal scopes is the IR Defense Hunter Mark II thermal imaging scope. Compared to everything else we’re taking a look at on our list, it’s an extremely serious thermal imaging scope, and a strong contender for the best thermal scope, both on our list, and in general. It’s built like a tank, the optics are impeccable, and it has a host of advanced features that would appeal to serious hunters. Let’s take a look at the details. The first thing that makes the Hunter extremely good is its Enhanced Target Recognition system. When you’re looking at a target that’s in front of the sky, or the horizon, it’s often washed out. Thanks to the ETR, which applies all the sensor’s gain settings on the target, this is no longer an issue. You get a very detailed target image instead. The 60Hz refresh rate makes things smoother. This is something you will especially notice during movement, whether it’s small or big. If, however, you’re low on battery, you can switch to 30Hz and last longer. In order to see the target clearly, you have a choice of three reticle options. The Thermal Combat Reticle, the Thermal Dot Reticle, and the Thermal Subtension Reticle all work extremely well and are very precise. The display on the Hunter is a MILSPEC Emagin OLED display. With a resolution of 640×480 on such a small screen, you can be sure that everything is sharp and clear. If you don’t want to use the built-in screen, though, there’s a video output port. You can connect an external display to it and use it for previewing. Inside the thermal imaging scope is an uncooled vanadium oxide micro bolometer detector lens. This lets you view a wide variety of targets. However, where it excels are hot and warm objects in absolute, total darkness. With the lens and sensor, there is absolutely no need for additional illumination. You will also get a few choices in terms of focus, with the Digital Focus Control. There are a couple of options, so you can get ideal focus in various situations. Moving on to the outside, we mentioned that the scope is built like a tank. The body is made of 6061-T6 aluminum. This is very resistant to corrosion, and will also help with shock resistance. In terms of water resistance, there is some, but we wouldn’t advise that you push it. It’s safe for up to 3 inches of water, for no longer than 15 minutes. It will survive a splash or a drop in a puddle, but submerging it wouldn’t be the smartest thing to do. The lens is an anti-reflection lens. Its primary function? To make sure viewing is unobstructed, clear and sharp. The coating helps with transmission of infrared light, and has been thermally stabilized. That last thing results in the high-quality, sharp images that you can’t really get with any other thermal imaging scope. In case you’re wearing glasses, the 27mm of eye relief should be plenty. This thermal imaging scope can be mounted on a Picatinny mount, thanks to the LaRue LT681 tactical mount it comes with. It has a quick release lever, so you can remove it at your convenience. This makes it easy to use as a standalone viewing thermal imaging scope, not just a riflescope. If you’d rather use it like that, you can carry it in the soft storage case it comes with. Also in the box are two lithium CR-123 batteries which you’ll need for operation. At 60Hz, they will last for around 3.5 hours. At 30Hz, that number goes up to about 5 hours. To wrap things up, the IR Defense Hunter Mark II Thermal Imaging Scope is definitely not for everybody. The first thing that sets it apart is, unfortunately, the price, which is very high. It also doesn’t offer too many smart features. This is something we’ve gotten used to with the other options on our list. Another thing it lacks is the remote control. However, it’s not meant to be used by the masses. It’s meant to be a serious, no-frills scope, and it manages to be the best thermal scope if that’s what you need, without hesitation. We’ll wrap up the list with another product by Pulsar, this time the Core RXQ30V. As its name implies, this is a budget oriented thermal imaging scope. Its goal is to give amateurs and people who don’t really want to spend too much a taste of how a thermal imaging scope works. It doesn’t have too many features, nor does it have extremely high quality optics. At the price it sells for, however, you couldn’t ask for either of those. 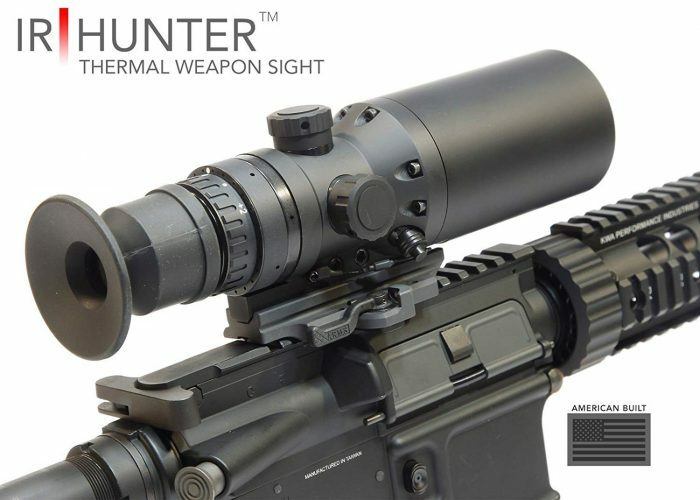 But even at that price, is it worth it in terms of thermal scopes? Let’s find out. The first thing we’ve noticed with the Core is its similarity with the Trail, at least where numbers are mentioned. It also has a 384×288 microbolometer, and the same 50Hz refresh rate. You must’ve noticed that the big boys have 60Hz, but 50Hz is actually sufficient. It is still a huge step up from the 30Hz of some of the competition. The detection range is also the same, coming in at 985 yards – just like the Trail. The difference is the magnification range. Where the Trail came in a couple of configurations, the Core is offered in one – 1.6-6.4 times. This isn’t a huge downside, though. It’s still a good option. The low range is almost as wide as your naked eye, and 6.4 times does get fairly close. Anything more than that, and the sensor would struggle, so it’s a good thing they stopped there. Where the differences with the Trail end are the smart features. Even though there is a wireless remote included, it’s just for the basics. You won’t find video and sound recording here, nor the StreamVision app compatibility. However, with the price difference, this is to be expected. The Core has a 2x or 4x stepped digital zoom. This is the less-preferred option, and we would’ve loved smooth zoom. While we’re at the zoom, it also has a picture-in-picture digital zoom, which comes in handy. The green sapphire display is very easy on the eyes. It lets you use the thermal imaging scope for extended periods of time without any eye fatigue. You can choose between three rifle profiles with three zero saves. Even though not much, if you have more than one weapon, it might come in handy. There’s also one-shot zeroing with freeze function. If you do need to zero the scope, it’ll be very easy. The thermal imaging scope is mounted with a quick detach mount. This lets you easily put it on or off your weapon, and you can use it as a handheld scope. There’s also a hand strap in the box, to make that a bit easier. If you’d rather use it handheld continuously, the carrying case might also prove to be useful. To wrap things up, the Pulsar Core RXQ30V is an interesting proposition. It’s much cheaper than its competition, yet gives you all the basics. However, it lacks any sort of advanced functionality. This makes it a no-go for many shoppers, regardless of whether they’re buying their first scope or not. If you don’t mind not having all that advanced functionality, and would rather save some money, this might be the best thermal scope for budget oriented users. Honestly, we couldn’t blame you if the list above left you with a few questions. Maybe you aren’t an expert in the field of thermal scopes, and don’t know what all those technical terms mean? Or maybe you just want a good explanation of what everything is. A good thermal imaging scope costs a pretty penny, and you do want to know you’re investing your money where you should be. Below, as promised, is our buyers’ guide. In it, we’ll do our best to explain the terms that might not be clear. We’ll explain what the numbers mean, and what technologies you should really pay a bit more for. Once you’re done with reading, you should have a good idea of which one of the thermal scopes above you should order. Let’s begin. Even though they often serve the same purpose, a night vision device is much different than a thermal imaging scope. Thermal optics aren’t cameras, but instead, they’re just thermal imagers. They were first developed, as well as used, by the military, but now they’re also used for fun and hunting. The main motive was to help with seeing things that were seemingly invisible. Based on the fact that animals emanate infrared energy which comes out as heat, we had thermal imagers. The heat signature is basically thermal energy, which is what was the guiding factor. To focus on the thermal energy being emitted, you need a special lens. The focused energy is then scanned by a phased array of elements of the infrared detector. It is these elements that give you a (oftentimes highly) detailed pattern of temperature. The pattern is known as a thermogram. Even though this might sound like a lengthy process, it actually happens in a fraction of a second. Once the thermogram is created, the thermal imaging scope translates it into various electric impulses. Then, those impulses get sent to a signal processing unit which translates them into data for display. The data is then displayed on your screen, and it appears as various colors on the scope. Depending on the intensity of the infrared’s emission, the colors vary. The image you get in the end is made from all the impulses the scope receives from the field of view. The main difference between this and night vision is that night vision tech requires some light source. It basically works by amplifying it so you can see objects like you would during daylight. Oftentimes the moon and stars are enough light, but some incorporate an IR illuminator for a bit more light. The difference in technology means that a night vision device might give you a more detailed, natural image. However, the image intensifier tubes inside can be damaged if exposed to bright light. Last but not least, if it’s completely dark, a thermal imaging scope can give you a better idea of what you’re looking at. The first guiding factor when you need a thermal imaging scope is your budget. None of the scopes come cheap, but just how much you want to invest is an important thing to know. 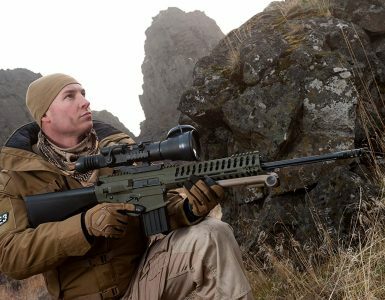 The basic principle is that a more expensive scope has more features and better optics. However, you won’t always use all those features. For example, the Hunter above has really high-end features, but many people would prefer Bluetooth and Wi-Fi instead in this day and age. As soon as you have a good idea of how much you can afford to spend, it’s time to start searching. One thing to keep in mind, though. If you want to get good features and stellar optics, don’t settle for a budget oriented option. Also, chances are you won’t be buying a second one anytime soon. Try to invest a bit more money the first time around, and get the best thermal scope you can afford. Another important factor is the usage scenario. The main purpose of thermal imaging scopes is often military scenarios, or maybe law enforcement. However, in recent years, there’s been a rapid rise in hunters who buy such devices. We aren’t talking amateurs and people who just picked up a rifle. We’re talking about professionals who really know what they’re doing. Even they have to start somewhere. Night vision and thermal imaging isn’t that simple, and making a mistake is quite possible. Therefore, you’ll want to know what you’ll be using your scope for. If you only use it for keeping your backyard clean of small animals, you could do with a cheaper one, with less magnification. If you use it for hunting in the mountains or forests, you’ll want a bit more magnification and detection range. Short hunting trips? Battery life isn’t that important. But if you’re pulling all-nighters, you’ll want at least a few hours of battery life. Uncooled thermal imaging or cryogenically cooled systems? On today’s market, you’ll find two main kinds of thermal imaging scope systems. They’re both excellent in their own way. Whichever you go for, you can’t go wrong. However, it is important to understand them, in order to know which one suits you better. The first type is uncooled thermal imaging. This is what is commonly used with thermal scopes around the world today. It is popular because all the elements that are required to detect infrared energy can operate in standard temperature. Therefore, you don’t have to worry about keeping the elements below 32 degrees. Because it doesn’t require anything extra, the process is fairly quiet. This makes the scopes ideal for hunters, which is why many of them prefer an uncooled thermal imaging scope. The downside, though, is that the readings can often be different, and they aren’t as sensitive as other systems. They are, however, cheaper than the other option. That other option are cryogenically cooled systems. Compared to the uncooled ones, they cost a lot more. They make use of internals that are perfectly sealed and kept to a freezing temperature or below, mechanically. If you’re near one, you can hear that they’re actually really loud. The advantage they have is that the temperature they’re kept in makes them much more sensitive. They’ll give you a much more accurate temperature reading regardless of the conditions you’re using them in. If you can afford one, and don’t mind a bit of noise, this might be a better option. Thermal scopes require batteries in order to run the display and all the electronics inside. More powerful magnification factors and more features need more power, and consequently, a larger battery. However, not all manufacturers put larger batteries. This often results in subpar battery life with many scopes. The deciding factor for you will be how much time you spend out during the night. For example, if you’re only going to be hunting for an hour or two, something that has guaranteed three hours of battery life will absolutely suffice. On the other hand, if you think that you’ll go out in the evening and not come back before dawn, you’ll want much more. A scope that gives you 8 to 10 hours is ideal, but hard to find, especially with all the smart features and high refresh rates. There’s a solution for this as well – just carry extra batteries. For example, if you have an Armasight thermal scope, you could get their extended battery pack, which should give you a few more hours. Or, you could see what kind of batteries the scope uses. They’re commonly AA, AAA or CR-123, and they all fit in your backpack or pouch. Carrying a few spares with you is never a bad idea. With binoculars, for example, you have two numbers – 8-10×42. The first set, 8-10x indicates the magnification factor, while the second one, 42, tells you the objective lens diameter. With thermal scopes, you still have a magnification factor, but the objective lens diameter isn’t that important and is often left out. Instead, you have the sensor resolution. Back to our original point, the magnification factor is what tells you how close you can get to your subject. With a 1x magnification, you’ll see like you would with your naked eye. With an 8x magnification, however, the target object is 8 times bigger. This can be very helpful when you want to get close to your target without physically approaching it. You don’t always want that magnification though, that’s why most of the scopes on our list have a variable magnification. Depending on the situation, you can choose between a number of magnification powers. If you only need the scope for your backyard, a smaller magnification number is sufficient. For longer distances and outdoor hunting, you’ll want more. Range is the other important number here. That’s what tells you how far you can see objects, which is basically the maximal useful range for a thermal scope. There are three types to remember here. Detection range is the range at which the scope can distinguish an object from the background. Recognition range is where you can actually classify the object, whether it’s a person, or an animal, or a vehicle. Last but not least, identification range is where you can see details regarding the object. The detection range isn’t too important when hunting, but you’ll need the recognition range to be sure it’s an animal, and the detection range to see what kind, and other details. The refresh rate is a very important factor when you’re choosing a computer monitor. Since your eyes will pretty much be stuck in close proximity to the thermal scope’s display, it’s even more important here. Basically, the refresh rate dictates how many times per second the image on the display will refresh. The more times it does, the clearer, and more lifelike image you’ll get. There are two or three main options. The first one, which you’ll find in many budget-oriented thermal scopes, is 30Hz. This might be sufficient when you have a stationary target, but for anything that’s moving, you’ll want more. The next step up is 50Hz, with 60Hz being the common refresh rate for higher end scopes. The difference can be very astounding, and it’s even more emphasized when you’re stuck to the screen. Therefore, for optimal performance, look for 50 or 60Hz. Just like with any other imaging device, the resolution is the amount of pixels that a sensor can capture. Unlike mechanical scopes, which rely on optics, thermal scopes rely on technology. With more pixels, you’ll get a crisper, sharper image, with more detail. Since thermal imaging won’t quite give you the detail you would get from a night vision device, the higher the resolution, the better the performance. You will often see the sensor’s resolution mentioned in the name of the scope, so look for a higher number. But, be prepared to pay a bit more for that pleasure, as well. A thermal imaging scope is something that’s built for the outdoors. There’s a big chance that you will smash it against something, or drop it, at some point. It will also get thrown in your backpack or your weapon carrying case fairly often, so you’ll want one that’s built well. Some shock absorbing materials such as a rubberized body could do, but a full metal build is best. Note that unlike mechanical scopes, that only have optics, thermal scopes have a lot of sensitive electronics inside that could get easily damaged. Next, you’ll want a way to mount the scope to your weapon. The common solutions are either a Weaver or a Picatinny rail mount, as that’s what you’ll find on your weapon. With higher end scopes, you might even find a quick release system. Just don’t get a quick release system on a cheap scope. Chances are it will get loose really quickly, and become more of a problem than a convenience. One more thing to know is that a scope that’s quickly removable means you could use it as a handheld scope if necessary. The third thing is the water resistance. With mechanical scopes, you also have a fog issue, but since this is all electronics inside, that’s not a problem. However, all those electronics can be easily damaged by a drop of water. Therefore, look for something that has a good IP rating. IPX7 or IPX8 is absolutely sufficient, but anything less than that might be an issue. It’s an outdoor device, so there’s a chance you might drop it in a puddle of water. Better be safe than sorry. As you saw above, choosing the best thermal scope for your needs isn’t such an easy task. First of all, it’s a lot of money, so any mistake will be a costly one. Next, you have a plethora of factors to consider, from build quality to numbers and sensor resolution, you will want a lot of things to work well for you. However, at the end of the day, it’s not unlike buying another thing you’ll use often. You consider your budget, you consider your usage scenarios, and see where you’re prepared to make a compromise, if necessary. We hope to have explained everything above – all that’s left is to order the thermal imaging scope that fits your needs best!